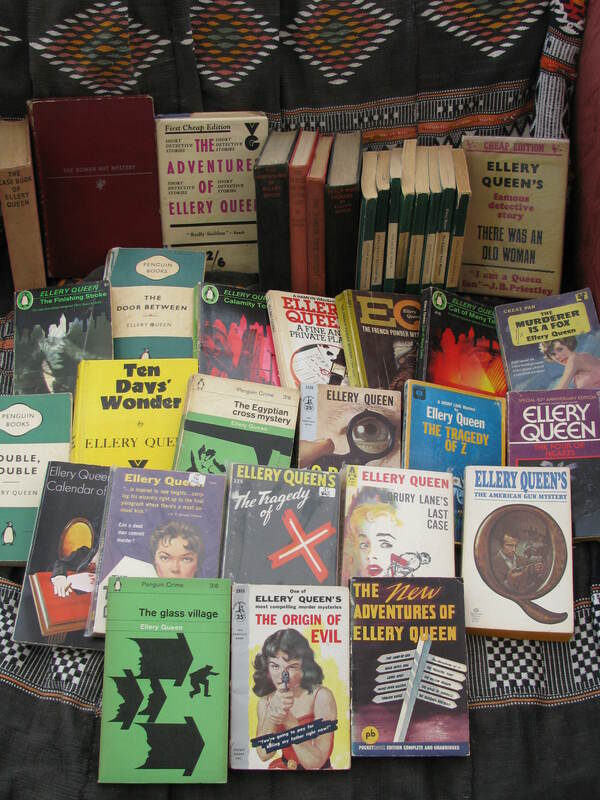 This is a summary page linking to hopefully what will be a complete set of reviews of the Ellery Queen novels. – the list of books follows and I would appreciate it if anyone better informed than me feels that I’ve missed something out or included something that I shouldn’t of. It’s based on the Wikipedia bibliography and the only omission that I’ve made is A Study In Terror as it sounds tangential at best. Links to reviews will appear as they are created. Obviously this is going to take a while to fill up, so be patient. Ellery’s first mystery (albeit not chronologically) as he investigates murder in a theatre and a vanishing top hat. A dead body in a department store window leads to the first classic of the canon, with a spectacular denouement. Murder in the operating theatre – a nice double bluff for those who’ve read too many detective novels. Or the one everyone includes in their “Best Of” lists – with good reason. Ellery fails to find a hidden will in a buried coffin – but finds an extra body instead. Crucified decapitated corpses. Do you need to hear any more? Ellery goes to the rodeo – and the writers push credibility a bit too far. Ellery gets stranded in a house by a forest fire. Murder and mayhem ensue. A classic. A backwards crime scene and a missing tangerine (or Chinese Orange) lead to one of Ellery’s more impressive deductions – although it does stretch credulity somewhat. A ladies man is found strangled, sitting on a patio, naked, apart from a cape draped around his body. A nice diversion for another of Ellery’s holidays. A murder in five acts – a more restrained set-up than usual and probably more straightforward to work out the murderer… although you might have to put yourself in a 1930’s mindset to do so for one or two of the assumptions. A rare locked room mystery for Ellery to sort out – no-one could have cut the throat of Karen Leith apart from the person who discovered the body. But we know she didn’t do it, so who on earth did? It’s off to Hollywood and the murder of a businessman with plenty of enemies but very few friends. Ellery goes undercover as he tries to sort out who actually killed him. Hollywood’s golden couple find themselves kidnapped and then poisoned. Ellery is in a race against time to prevent their children from suffering the same fate. Ellery, along with his assistant Ellery, opens his own detective agency, just in time to deal with a most peculiar will and the murder that follows. A more serious tale of family tragedy. No one but Jim Haight could have poisoned the victim. So why is everyone convinced of his innocence? A typical mystery novel family – a domineering matriarch and a bunch of weird children – including how to use a duel to murder someone, but not in the obvious way. A serial killer stalks the streets of New York in a change of pace for the series – currently links to a joint review by myself and Patrick of At The Scene Of The Crime, but I will update this with my own review when I get to it in sequence. Possibly an early attempt at finishing the series – another odd household of guests – and some very odd cryptic messages. The first ghost-written novel and a significant departure in plot as well. The murderer is clear, but who is giving him the instructions? Drury Lane, retired actor, investigates the impossible poisoning of a businessman on a crowded tramcar. Another barmy household – containing one of the cleverest things I’ve seen in a mystery – namely, why would someone choose an antique mandolin as a murder weapon. ADDENDUM: For anyone who’s impatient or, for whatever reason, desires a second opinion, then try Ellery Queen: A Website In Deduction for an existing complete bibliography – it’s in the QBI section. A really excellent summary and extremely intelligible to the uninitiated I would have thought in providing a, overview of the strengths, weaknesses, themes, gambits and approaches of the Ellery Queen oeuvre – thanks. Have yet to find out ‘who’ was responsible for writing the ‘Djuna’ childrens books by Ellery Queen Jnr? To be honest, I don’t have any interest in these books – if I stumble across one in a bookshop, then I might give it a go… possibly. Love Ellery Queen. I subscribed to the magazine for years. Thanks for the titles. Also, I didn’t know about the farming out. I suppose that’s why some are good and some not so. Not sure how often you’re updating this list still, but I would recommend origin of evil as your next pick if you can find a copy. It was the first Queen novel I read, and both me and my friend enjoyed it a lot. I would love to see how it stacks up in your mind against the others. Thanks for the tip. I am trying to do them in order so it should be The Murderer Is A Fox next but I might skip ahead as that one’s a bit dull. I have fond memories of Origin so I might jump to that one. I see that you haven’t read The King is Dead yet. I was quite impressed with it, though it’s been several years since I read it. But, then again, I was impressed with The Murderer is a Fox, as well, though the puzzle element wasn’t as well integrated with the literary aspect of the book as it might’ve been. I gather that there was some tension at the time between Dannay’s puzzle plotting and Lee’s desire to write in a more literary fashion. I will be returning to Queen sometime soon and The Murderer Is A Fox will be the next one. I guess you will be inspired by Rich choosing 1945 to return to your Queen reviews with FOX. I just found this page and am looking forward to reading your previous reviews and comparing them with my own opinion! Long live the Queens! That’s exactly the reason. Well spotted. I’m glad to see you getting back to EQ and am looking forward to your review.